Fished the arm with an old buddy and former stellar member, SWC, who now lives on the west side, Brian. We picked up probably 15 fish keeping the larger ones shown here. Water temp 44-45, slightly stained water, not bad. We had to quit early , around 3:00 and timed our arrival back in Spokane right at rush hour. We’ll fry ‘em up tomorrow. We found fishing to be tough in the Spokane Arm. It was really hard to find any keepers. We ended the day catching about 25 walleyes but only kept 7. The largest fish was a 16 inch male. Many of the walleyes that we caught were only 11 or 12 inches. We launched at Ft Spokane around 930 am and headed up the Spokane Arm. We fished several spots until about 430 pm. We only managed to catch 6 walleyes between 12 and 15 inches. Allan’s Humminbird measured the water temperature between 40 and 42 degrees. This was Allan’s 4th trip to Roosevelt in the last 10 days. He claimed that the water temp was in the mid to upper 30s a week ago with ice near the launch first thing in the morning. Went down on Mon. Oct. 1st. Set up camper at Tucannon RV Park. Fished toward the afternoon of that day, pulling out near 6p.m. Caught 6 more perch, one 16" walleye and one 15" catfish. My partner, Mark (not Dianne this trip) caught one more perch. We headed in around 5:45 and cleaned our catch in the failing light after we loaded the boat. Tues the wind came in. I'd estimate the speeds hit 30 mph at times. We stayed in camp all day. Wed. I caught another catfish (12") and another small perch in the morning. That was it. I caught another catfish and one more perch in the afternoon. I had originally planned to stay until Thurs, but cut the trip short due to the poor fishing. Side note: they are catching Salmon along the north shore downstream from the Lyon's Ferry campground. Some folks were leaving the dock to do just that when we pulled out Wed. afternoon, and one boat reported getting their limit of salmon before switching to walleye for the remainder of the day. Week of Sept. 17 to Sept. 21. Weather was pleasant; wind mild. Finally had opportunity to get on the water after the long hot summer and other obligations. 1st day, we boated only 4 small fish, the largest of which was 12". 2nd day, we no success except a couple triploids incidental to the walleye fishing. 3rd day, we again hooked triploids. After hooking triploids incidental to walleye fishing, we wrapped up our week going after them the evening before we left for home. Jack did catch a 17.5" smallmouth from shore. It liked 2yr. old marsh mellows. I used the old marsh mellow / worm set up. Eight times, he nipped the marsh mellows off my hook, and left worm untouched before he finally hooked himself. Thinking I might have to try them on crawler harnesses. At any rate, I won't go back there without marsh mellows! Ken and Sharon V consistently put fish in the boat during the Fall Camp Out at Lake Roosevelt. 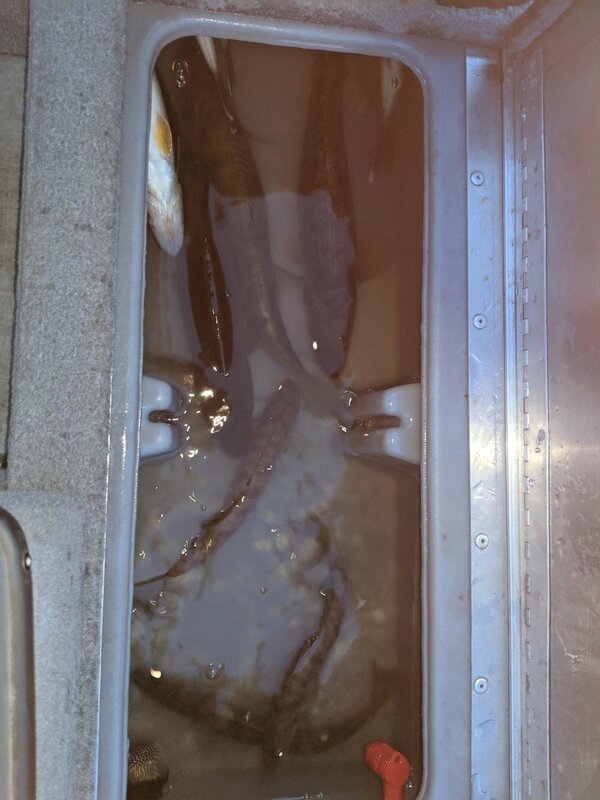 Their best day was Sunday when the caught 17 walleyes when coworker Tony M joined them. They didn’t get anything big. Sharon’s text said the fish were 18 inches and under. She also said that they had a great vacation. I had to work the weekend of our Fall Campout at Ft Spokane, but was able to fish one day and meet up with the group. I brought my coworker Steven out for a day of fishing. He hasn’t fished much but turned out to be quite good at it. Even though fishing was slow (terrible at times), he caught more fish than I did. By the end of the day, we caught 12 walleyes (several too small to keep), a trout, and had a big smallmouth to the boat before it broke our line. The rest of the Walleye Club also experienced slow fishing with most boats only picking up a few fish. I spent Labor Day weekend on Lake Roosevelt on a mixed fishing / family camping time together. Walleyes were active very early and late in the days on crankbaits over rocky points. I fished for about two hours two mornings and one evening and ended up with 10 walleye and three smallmouth bass. I met Ken Monday evening. We fished for an hour until the sun set. We caught a 17 inch walleye and a bass before heading back to camp. We hit the water before 8 AM on Tuesday. It took us until 11 AM to put our first walleye in the boat. We moved around a bit and finally found some active walleye among a bunch of little bass. By 3 PM, we landed 7 walleyes between 16 and 21.5 inches. Ken headed home, and I stayed for a couple more hours. Ten minutes after I dropped Ken at the ramp, I hooked into a 23 incher. We ended up catching a total of 11 walleyes (larger ones released), dozens of little smallmouth, and 2 catfish. Ken caught 3 walleyes fishing by himself on the Snake River Monday. He went through lots of nightcrawlers to catch his walleyes. There were a lot of little perch, bass, and bluegill stealing his bait. He didn't catch as many walleyes as he had hoped, but he landed and released a 30+ incher that weighed 11 pounds and 4 ounces. Nice work, Ken!!! Ken and a buddy caught this bunch of walleyes on Roosevelt on Sunday. We did okay at Banks Lake. We got 16 walleyes on Saturday and 5 on Sunday. Tom and a couple of his buddies from the Tri Cities fished with me. It was windy from 7 am til 9 am both days then it laid down. Our family rented a cabin for the weekend near Lake Roosevelt. 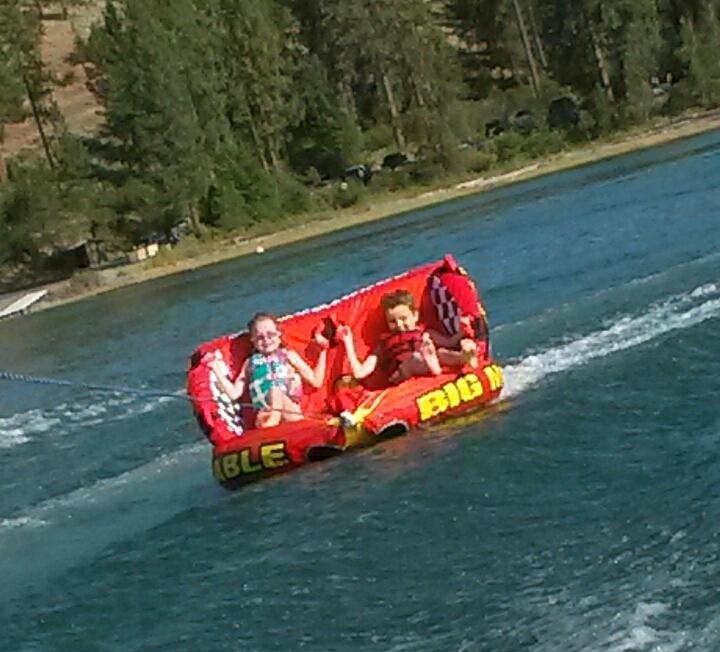 We spent most of our time playing board games, hiking, biking, swimming, and tubing behind the boat. Lindsay and I did sneak away on Saturday for an hour of fishing. Within 10 minutes, she had two walleyes in the live well. After an hour, she had 4 walleyes and I got 1. That was plenty for fish tacos that evening, so we picked up her mom and brother and boated the rest of the day. At the dock, we ran into Scott M and a couple other club members. They were cleaning a mess of fish after a successful morning. I had a good day on Sunday. I took out a newbie who hasn't fished in 20 years and we both pulled plenty of fish. In total we pulled 19 walleye and 2 bass. We also lost 3 during the fight of which one felt like it might have gone a couple of pounds. Every boat had a few fish, but nobody that we talked to on Sunday had over 5 of them. The rumors are true....... The average size of the fish in the Arm seem to be an inch or two better than the average size in previous years. Also, the "will to live" seemed stronger in these fish than in previous years. There were a couple where I thought they were smallys before I saw them. They are also slightly chunkier than in previous years. The reservoir is at full pool and the water is very clear now and if we had any wind, we would probably have limited. As it is, it was still a great day with steady action throughout. When your fishin' cranks, you can cover a lot of water and find the active ones. Ken took a buddy from church to Ft Spokane. He claimed that the fishing was "slow", but managed clean 18 walleyes and a 19 inch trout. The lake continues to rise, so spots that were productive a week or two ago may not hold fish any longer.